Photo courtesy of Lakewinds II cluster website. 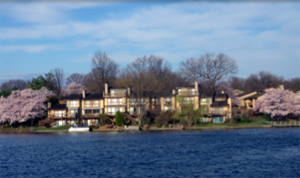 Lakewinds Cluster is situated on shores of Lake Thoreau in South Reston, Virginia--one of the loveliest spots Reston has to offer (which is saying something). The charming homes are located with in walking distance of South Lakes Village Center, and are a short drive to the Dulles Toll Road and Reston Metro Station. Lakewinds consists of 93 brick and cedar townhomes, of which about 70% on the lakefront. In fact, many residents have small boats or barges to take advantage of the lake. The 3-level 3 and 4 bedroom homes were built between 1975 and 1978. Lakewinds is divided into two clusters, Lakewinds I and Lakewinds II. Each home has assigned parking spaces; the Lakewinds II townhomes have one carport spot. The local schools are Terraset Elementary School, Langston Hughes Middle School, and South Lakes High School--all of which are within walking distance. Other nearby South Reston attractions are the Reston Regional Golf Course and Walker Nature Education Center. In fact, this neighborhood is great for anyone who values spending time outdoors!